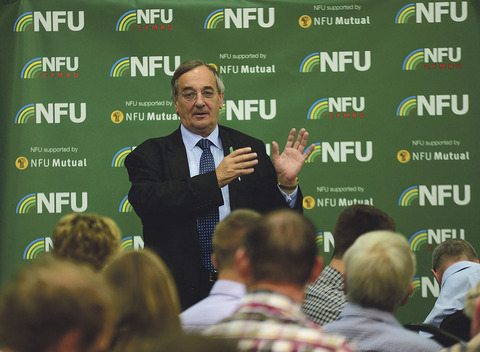 Patriotism brought on by Brexit means the British public is ready to support British farming but the industry now needs the Government to back it, according to NFU president Meurig Raymond. Addressing the first of the NFU’s Brexit member consultations in Preston, Lancashire, on Tuesday, union chiefs discussed the options for farming and debated what farmers would like to see in a new British agricultural policy. Mr Raymond said there was support for farmers from the public and retailers and the Government was, ’in principle’, ready to back British farmers. But Mr Raymond revealed he had met with one of the UK’s largest meat processors a week after the referendum, who said he had money to invest, but would not risk his money if the UK ’pushes for butterflies rather than food production’ in a new agricultural policy. David Potts, chief executive of Morrisons, had also contacted him with concerns if the Government ’does not support British farming, there will not be any British farmers to support’. Mr Raymond reassured farmers the message about food security and farming had resonated with the Chancellor and Secretary of State in recent meetings. The NFU president said Philip Hammond had made it clear his priority was to remain in the single market. Phil Bicknell, NFU head of food and farming, said this would give tariff free access for British exports in Europe, but it would have to accept single market legislation, freedom of movement and pay a budget contribution. Farmers in the audience suggested this would not be accepted by the general public as ’Brexit was lost on immigration’. One questioned whether farming’s voice would be heard over large environmental lobbies but Mr Raymond highlighted his ’encouraging’ meetings with key Ministers. He also said he had emphasised how ’profitable farmers will invest in the environment’. Mr Raymond said surveys had shown the public was prepared to back British farmers and highlighted the success of higher priced milk to support British farmers in Asda and Morrisons. Peter Snodgrass, partner at law firm Shakespeare Martineau, agreed it was ‘vital’ the UK has access to trade with the EU. "The Government must establish a positive trading relationship with robust trading agreements in negotiations leading to the Brexit." He said he hoped by 2020 there will be plans in place for a transition to the new UK food policy and highlighted food security as a priority. "The sustained low commodity prices are still a deep concern for farmers. "The industry will need to continue to be creative and forward-thinking in finding income streams alongside food production."